I was looking for a way to show you all how much snow we’d had this year, and it’s not over yet, we’re having another snow storm today. It’s tough to take pictures of something white that’s practically everywhere! So I decided on this little apple tree in the backyard. 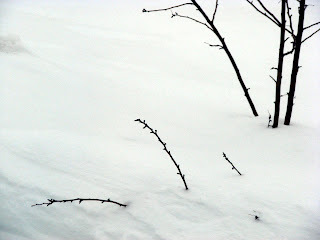 Planted just about 2 years ago, it’s tiny branches are now sticking out under more than 4 feet of snow! On days like these, I tell myself the snow will be melting until July! And then, I shrug it off, grab a biscotti and dunk it in a hot cup of coffee. Which brings me to the recipe. 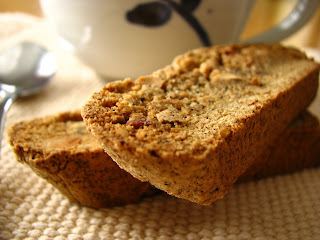 It’s from Ricardo, again, and they’re the first biscotti I ever made. Of course what drew me to this particular recipe was the use of the ground coffee in the batter. I was intrigued at what the texture would be like. 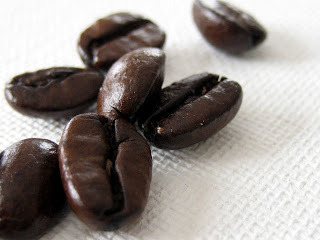 Crunchy and full of coffee flavor these biscotti are wonderfully easy to make. Snow storm or not, you must give these a try! In a small bowl, mix water and coffee, set aside. In a large bowl, with an electric mixer, beat butter, sugar and egg until well mixed. Add ground almonds, roasted almonds and coffee mixture and mix well with a wooden spoon. In a separate bowl mix together flour and baking powder then add to almond mixture. Mix until a ball forms. The dough will be very stiff and you might have to mix with your hands. Transfer the dough to a parchment lined baking sheet and form into a log about 16 inches long. Bake in center of oven for about 30 minutes. Remove from oven and cut log diagonally into ½ inch slices. Place the slices on the same baking sheet and bake 15 to 25 minutes, depending on how crunchy you want them. I like them pretty crunchy so I baked them 25 minutes. Cool the biscotti on a baking sheet. These are absolutely delicious, of course, dunked in a hot cup of coffee! These sound gorgeous, and looking at the lovley photos makes me want to grab a coffee and make some! Please let the snow melt before July! Ugh, I've had enough of it. Not enough biscotti though, send some this way! Those look so good! 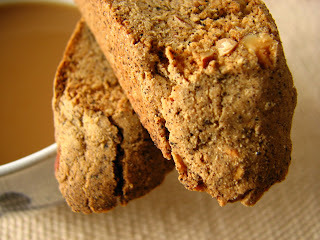 I just finished my batch of almond biscotti, I must try these now. Beautiful biscotti. They look like the perfect antidote to a snowy day. Alfie - Thank you, you should make some! Brilynn - I've had enough too but I fear it's not over yet! Paxye - Mmmm, almond biscotti sound good too! Mandy - We're supposed to have another storm this weekend, ugh! Sharon - Yay! I can't wait to find out how you liked them! Lynn - I was in need of a pick me up and these were perfect! Aaaaargh! You're killing me with your snow! I love it! ....and the biscotti's not bad either! i just experienced some of that snow when i flew to ontario for the weekend. but that biscotti looks amazing! I have been looking for a recipe like this for years! When I was small, my Great Aunt used to make some biscotti that had a layered effect and the bottom layer was the ground coffee, then a layer of nuts mixed with bittersweet chocolate....I will definately try this one! thank you so much!